Here is my Mic-Key GJ Button. When I was in the hospital the doctors put this is my stomach so that I could eat. The balloon in the middle keeps the GJ Button in my stomach. The long tube at the end goes through my stomach and into my intestines. This way there is no food in my stomach to throw up! I don't really like to have food in my mouth and I don't eat enough orally so this helps me grow and stay healthy. My mommy puts a special extention in the button that fits onto my feeding pump so my food can go in. This button has to be replaced every 3 months at the hospital with an x-ray machine so they can make sure that the long tube is in the right place. 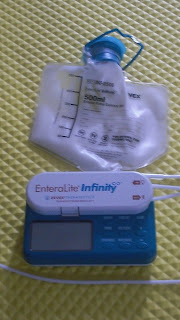 This is my feeding pump.It gives me my formula slowly over a period of time. I eat a couple of hours a day but most of m y food is given to me at night while I sleep.